Superman may be faster than a speeding bullet, but he’s having trouble outrunning Zack Snyder’s pacing issues. After 2013’s “Man of Steel” earned flack for its grim, self-serious take on Superman — who’s admittedly tougher to drag into the shadows than Batman — Snyder returns with its sequel, “Batman v Superman: Dawn of Justice,” a slightly more enjoyable outing that ultimately feels like more of the same. Picking up 18 months after “Man of Steel”, Metropolis’ destruction following Superman (Henry Cavill) and General Zod’s slugfest leaves the public divided over whether Superman is a hero or a danger to the human race. To make matters worse for the Man of Steel, billionaire Lex Luthor (Jesse Eisenberg) has recovered fragments of the mineral Kryptonite from Zod’s ship, which he intends to weaponize against Superman. As a spectator to the Zod fight, Bruce Wayne, aka Batman (Ben Affleck), also sees Superman as a destructive time bomb and decides to steal the Kryptonite from Luthor to kill Superman himself. Despite the movie’s two-and-a-half-hour runtime, the plot is remarkably sparse. Director Zack Snyder dedicates far too much of the film reiterating Superman’s unregulated controversy in news segments and protesters calling him an illegal alien. These ideas are compelling at the beginning but very quickly become tiresome as the film wears on. One side plot, which takes up a solid half-hour on its own, features a Kentucky senator (Holly Hunter) and a former Wayne Enterprises employee (Scoot McNairy), who was injured in the Zod battle’s destruction, holding a hearing about potentially regulating Superman’s actions. While interesting in theory, it doesn’t contribute much value to the plot and just delays what we really paid to see — the action — until the two-hour mark. This is true of a lot of the film — it’s a long movie, but it really has no reason to be. Hardly anything moves the events forward or develops the characters beyond their comic book archetypes — this is especially seen in a few over-stylized dream sequences that stop the movie in its tracks for minutes at a time. The title and ridiculous amount of trailers promise an epic battle between arguably the two most iconic superheroes of all time. The mashup has been a highly anticipated concept for years, dating as far back as 2007, when Warner Bros.’ apocalyptic “I Am Legend” teased fans with a Superman/Batman movie logo on a weathered theater screen. The hype around this mashup’s dogged materialization makes it all the more disappointing. The two characters only meet a handful of times in the first two hours — once purely for the sake of growling some stilted threats at each other. When they finally clash, the action is hard to follow, consisting mostly of Batman beating down a Superman who doesn’t want to fight. The fight ends up lasting only a brief moment before they predictably reconcile their differences to fight Doomsday, the hulking gray CGI monster Luthor creates to compensate for his lack of physical prowess and superhuman power. As awesome as the “Dawn of Justice” subtitle sounds, especially as a nod toward the Justice League’s formation, this too is overhyped, appearing almost entirely in emails Bruce Wayne discovers, containing photos of the soon-to-be united team’s individual heroes, in Luthor’s private files. So what was good about it? The acting, for one — I don’t think anyone turned in a disappointing performance, including the eccentric Eisenberg as Lex Luthor. Eisenberg is going to get a lot of flack for his ridiculous overacting, but his manic take on the iconic villain brings some color and fun to an otherwise gray and joyless movie. Jeremy Irons also shines as Bruce Wayne’s butler Alfred, and Affleck pulls off an old and cynical Batman incredibly well. With Michael Caine and Christian Bale’s excellent performances as the butler and hero, still fresh in our minds from Christopher Nolan’s “Dark Knight” trilogy, a copy-and-paste job would have been easy. 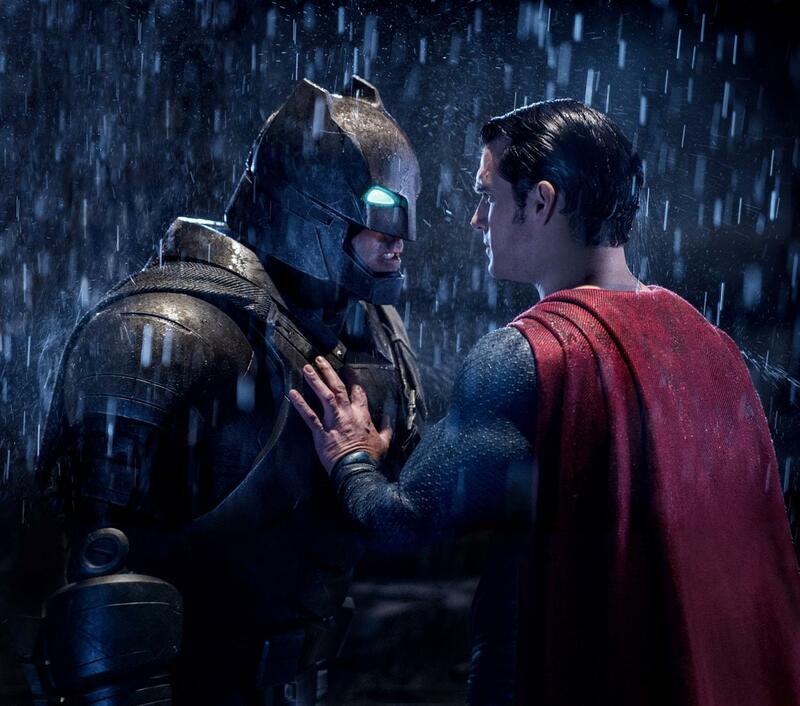 But Irons and Affleck bring a new and refreshing take on the characters. Wonder Woman (Gal Gadot) is also an excellent addition to the film, regardless of how briefly she graces the screen. Apart from a three-minute fan film and a Philippino spoof on the 1960s Batman TV series, this is the first time the heroine has appeared in a live action film — and while her role here is small, she leaves a resounding impact. Gadot seems more than capable of carrying her own film, which is due out next year. If anything, we can be grateful to “Batman v Superman” for proving its actors are more than capable of bringing their characters to life with the right script ­— and that, at least, is worth getting excited for.